Are you ready to spice up your holiday cooking this year? 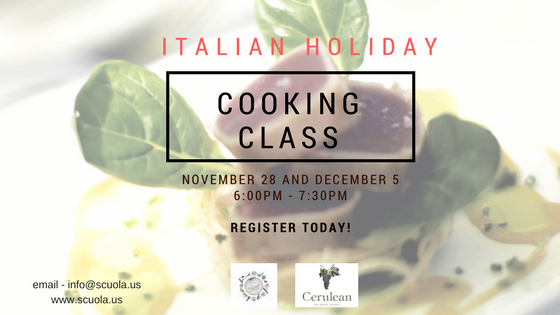 Join us for a special Italian Holiday Cooking Classes series on November 28, 2017 and December 5, 2017 from 6:00pm â€“ 7:30pm at the lovely Cerulean Wine Bar at 1431 NW Marshall Street, Portland, OR 97204. You can learn how to cook delicious Italian style holiday dishes, all while enjoying Ceruleanâ€™s delicious wines. The series costs $95 ($70 tuition and $25 registration fee covers both classes in the series) and includes a glass of Cerulean wine, the recipe, a taste of the completed dish, and Cerulean will also provide a wine pairing list for the menu. You can then expertly purchase a perfectly paired bottle of their wonderful, locally made wine to bring to dinner and really impress your family around the holiday table. Buone feste!